I am Latino male, descending from Albuquerque, New Mexico. My immediate grandparents are from Mexico City and are descendants of both Aztec and Spanish settlers that settled in modern day New Mexico. As a Latino, my family's relationship with food has been one that was and is, rooted in love for one another and our culture. Our cultural gatherings have always been centered around our expression of respect for our culture through our food. I am an alumnus of the University of Arizona, class of 2012, for both my undergraduate degree in Nutritional Sciences as well as my dietetic internship, completed in May of 2016. I initially had an interest in pediatrics and found the nutritional sciences program due to its curriculum, [which were] pre-medicine prerequisites. After years in the program, I decided to forego medical school, because of the realization that my love of culture and family, was centered around food, and all of the surprising connections that it helps to facilitate. A constant search for learning spawned my love of health and wellness. What do you do now as an RDN and what does a typical day or week look like for you? My typical work week is non-traditional to say the least. While I spend the beginning of my week helping and serving my community, my week shifts towards the end of the week with building my online consulting business. I also commute to Phoenix arizona, to continue my work with the Milwaukee Brewers ball club. This has been an absolutely dream of mine to help and promote young professional athletes in their pursuit of professional athletics. This is all followed by my most important roles: a husband and father to two amazing girls. My overall goal for working close to 70-80 hours a week (in the short term), is to utilize better opportunities for more passive income so that I can have more work and family-life balance so I can be the best father and husband, that I was meant to be. I would say that the most pressing challenge was feeling as if intern coordinators were looking for the "ideal candidate," often dismissing, in my opinion, men of color, and those that did not have a GPA of 4.0. I felt a yearning to inspire change and culture, and I was able to accomplish this through networking and working with the eating disorder population. In doing this, I was able to find the importance of coordinating with other clinicians of color, thus providing me with further confidence that I was a fantastic clinician that needed a chance. I got this chance through the connections I made at my alma mater. Absolutely! I have been very fortunate to have been mentored by fantastic clinicians of color, and those that believed in the same purpose that drove me into this field. Regardless of my cultural background, I was able to see that I needed to work harder and more efficient, which prompted me to seek mentorship and opportunity. I believe that the future of dietetics will create better opportunities for clinicians like myself, to have more flexibility and more massive reach with the use of online nutrition platforms, social networks, as well a better balance for work, family, and balance. All while spawning a resurgence of entrepreneurship and creativity-minded individuals like myself. I genuinely believe that the more diverse our clinical population can be, the better that we can be more empathic in our approach to a broader, more varied health-driven community. By creating better cultural diversity, only then can we seek better cultural equality. I would tell them to seek opportunity and connection with reckless abandon. You may not always be understood, sometimes feared for your beliefs, and often not given a fair look; but you will change the field of dietetics for the better. If you don't fit the "ideal candidate," create your own version of this. Be authentic, and other people in power will seek your expertise and drive. Dezi lives in Tucson, Arizona. 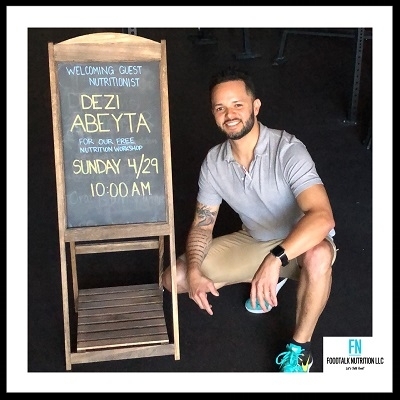 As a passionate entrepreneur, Dezi currently owns his own consulting practice, Foodtalk Nutrition and is a consulting dietitian for the Milwaukee Brewers, a major league baseball team. In addition to this, he also works at a community health center that supports the healthcare needs of the uninsured and under-served in Southern Arizona. Dezi even has a TED talk that you MUST watch! You can find him on Instagram, Facebook and LinkedIn.